1. Preheat the oven to 220°C, gas mark 7. Simmer the potatoes in water for 5 minutes until just tender; drain. 2. Heat the oil in a large frying pan over a medium heat. Sauté the onion for 8 minutes till softened, then add the garlic and chilli and fry for another minute until fragrant. Stir in the cavolo nero, cover and cook for 6-8 minutes until wilted. Season and set aside. 3. Meanwhile, make the sauce. Mix the cheeses in a bowl. Melt the butter in a saucepan over a low heat, then add the flour and cook, stirring constantly, for 3-4 minutes until pale golden. Gradually whisk in the milk until you have a silky sauce. Heat, stirring, almost to a simmer, then take off the heat and stir in the nutmeg and two-thirds of the cheese; season. 4. 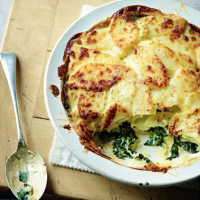 Lay half the potatoes in a 1.8-litre baking dish and cover with the cavolo nero mixture. Top with the remaining potatoes and pour over the sauce. Finish with the remaining cheese and bake for 25 minutes until golden and bubbling. Serve immediately.